If you happen to love bike riding and you are good at DIY tinkering, then a bicycle engine kit is for you. It allows you to transform your standard bike into a motorized one capable of achieving speeds as high as 40 miles per hour. You will still have to do a reasonable amount of pedaling, especially when going uphill. However, other than the minimal pedaling, a motorized bicycle is an efficient way of moving around especially when you consider how fuel-efficient it is. To get the most out of your motorized bike kit; there are some things you should consider. For instance, you should match the kit to your present bike. You should also understand the fuel to oil ratio required (Source). 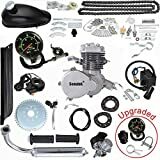 Here is a review of the top-rated motorized bike kits complete with all the information you need. 5 4. 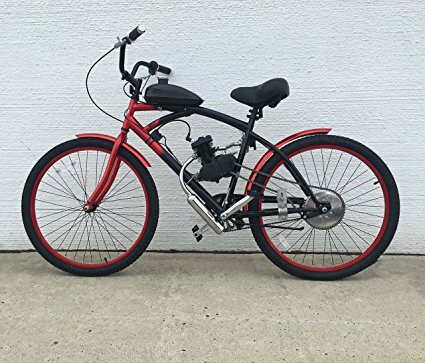 66/80cc Flying Horse EPA Approved Silver Angle Fire 2-Stroke Motorized Bicycle Engine Kit—The Most Environment-Friendly Motorized Bicycle Kit. Flying Horse is a reputable engine kit manufacturer, and their products are usually durable and of high quality. 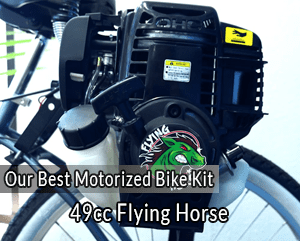 The 49cc Flying Horse 5G 4-Stroke Bicycle Engine Assembly Motor + Carb + Exhaust is no different. The engine’s height is 9”, the width 7” and length 9.5”. That means you need about 14 inches of clearance between the top and bottom bars for the engine to fit well. Therefore, if you own a 20” bike, this kit is not for you. If, on the other hand, you own a 26” cruiser type of bike, the kit will suffice. While this motor can either sit inside a frame or be rear mounted, you have to purchase the accompanying kits that allow this. For instance, if you want to rear mount the motor, then you have to buy the friction drive kit that makes it possible to install the engine on the rear of the bike. The 5G denotes that the motor is 5th generation. 49cc is the engine’s capacity, and in combination with other factors such as Horse Power, it helps determine your bike’s top speed after installation. The 49cc 4-stroke motor, in particular, is designed to provide 10.2 KW of power and to reach speeds of 15 mph though you can always push it more. The bike can travel up to 100 miles per gallon which means the motorized bike kit is incredibly fuel efficient. It is essential to note that while this kit comes with an assembly motor, a carburetor, and an exhaust, other components such as the transmission are not included. However, the parts involved are readily compatible with transmissions manufactured by other brands. That means if you already own a transmission or would prefer to purchase a transmission from another brand, the motor will still work. Also, this kit would make a perfect replacement kit, if you wish to replace any of the components listed. The kit’s powerful engine that can easily move the bike uphill. Compatibility of this kit’s components with parts manufactured by varying brands. The kit is sturdy enough and long-lasting. The motor uses a forced air displacement cooling system which deals with overheating. Easy to mistake this kit for a full bike engine kit. Another Flying Horse product. 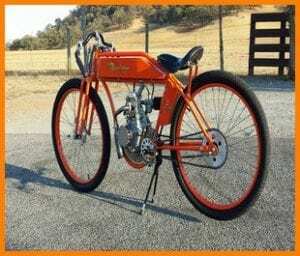 The first thing to note is that the Lock N Load Bicycle Engine Kit is a full engine kit consisting of all the components you will need to motorize your bicycle. The motor is a 5th generation (5G) which means it has dual chain transmission. Dual chain transmissions are considered the best working transmissions for bikes. That it is a 4 stroke means it is quieter and does not require as much maintenance. The engine kit has both a centrifugal clutch and a pull start. As a result, you do not need to engage or disengage the engine manually. Instead, you pull the starter chord then follow this up by hitting the throttle. The engine has an independent oil reservoir, and that means the headache of determining the ratio of oil to gas mixture is over. The separate reservoir facilitates a well-lubricated engine which plays a significant role in ensuring the motor is reliable and long-lasting. The engine has a 1.5-2.5 Horse Power (HP). Consequently, your bike will be able to reach a speed of between 20 and 25 mph. Additionally, the bike will easily travel 100 to 150 miles per gallon. This kind of high performance ensures you get value for your money if you decide to buy the kit. The kit is designed to fit nearly all the bikes with standard tires easily. Because the motor mounts over the wheel and not on the frame, it makes it easier to attach this particular motor on a wide variety of bikes. That includes bikes with non-standard frames. Thanks to the motor’s dimensions (9 x 9.5 x 7.5), the engine is compact which means that once installed, it will not spoil your bike’s aesthetic. Easy to mount and install—approximately three hours. The engine is compatible with tires of up to 3”. The motor has enough power for hilly terrains. The kit lacks an installation manual. Seeutek is just as reputable a brand as Flying Horse. 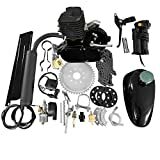 This kit from Seeutek comes with all the components and instructions required to motorize your bike fully. It fits most bikes with 26” and 28” wheels. It is advised that your bike have at least 9-11” of clearance between the bottom bracket and the top bar. Examples of the bikes that fit well with this kit include the Mountain bike, a Cruiser or a Chopper Road. The kit has an 80cc engine capacity, it is a 2 stroke, and it has between 5 and 6 HP (Horse Power). Thanks to this kind of Horse Power, your bike can go as fast as 35 mph. Also, your bike will be able to travel 100-150 miles per gallon. That means the kit facilitates fuel economy. Note that because the engine is a 2 stroke, it does not have an independent oil reservoir. You have to mix fuel and the engine oil at a ratio of 16:1. It is essential that you maintain this ratio for new sets then shift to a 25:1 ratio after covering 300Km/186.5 miles. Oil is vital to the health of an engine, and it is prudent that you never forget to mix the fuel and engine oil if you want to prolong engine life. The Seeutek PK80 does not have a pull start. Therefore, to start, you need to move the choke lever to the “on” position. Follow this up by holding the clutch and pedaling the bike fast to get some speed. Finally, gradually release the clutch. To stop, disengage the clutch and apply the brake. The kit comes with an analog speedometer that allows to gauge your motorized bike’s speed and control it. That way, you will easily avoid tickets. The kit comes with a comprehensive guide. Reliability, especially after the upgrade. For instance, screws on the engine have been replaced with hardened ones. The power is high enough for hilly and uneven terrains. You might be forced to replace some parts, for example, the throttle cable to maximize efficiency. 4. 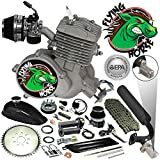 66/80cc Flying Horse EPA Approved Silver Angle Fire 2-Stroke Motorized Bicycle Engine Kit—The Most Environment-Friendly Motorized Bicycle Kit. If you are environment conscious, then this is the kit for you. The engine is certified by the United States Environment Protection Agency (E.P.A). It is a complete kit perfect for a beach cruiser, mountain bike or road bike. The engine has a 66/80cc carburetor that is high performance and gives an extra boost of power. The engine is powerful enough that you can comfortably ride at speeds of between 25 to 35 miles per hour. The fuel economy is at 150 miles per gallon. That means going green will not affect efficiency since the 150mpg is comparable to other high performing kits. The reason this particular kit is EPA certified is that it complies to EPAs emission standards. It has a special muffler complete with a catalytic converter that helps clean exhaust coming from the engine. Also, it uses a particular kind of synthetic oil known as AMSOIL SABER that helps keep emissions to a minimum. Similar to other 2 stroke engines, you need to mix the gas with oil. The Flying Horse Silver Angle Fire requires a 1:100 ratio of gas to AMSOIL SABER Professional Synthetic 2-Stroke oil. With this kind of ratio, the motor is not only cleaner, but emissions are also minimal. Note that with this kind, you cannot use other oils or fuel ratios. If you do so, then you will damage your engine. Note that similar to the Seeutek discussed above, you have to use a clutch and pedal to start the engine. Quiet compared to other 2-stroke kits. Using any other kind of synthetic oil voids the warranty. This motorized bicycle kit from Roadstar not only fits most 26” and 28” wheeled bikes, but it also fits most 24” wheeled bikes. It comes equipped with a 2-stroke 80cc engine that has enough power to achieve a top speed of 38 miles per hour. 38mph is as fast as a scooter or motorcycle. The 5-6 Horse Power helps facilitate this kind of speed. Consuming approximately 2.5 liters of fuel per 100Km; the motor is fuel efficient. The consumption translates to 100 miles per gallon. The tank has a capacity of 2 liters. As mentioned, it is a 2-stroke engine, and that means you have to mix the fuel and the gas. Mix fuel and the engine oil at a ratio of 16:1. Maintain this ratio for new sets then shift to a 20:1 ratio after covering 500Km/310.6 miles. Similar to the Seeutek, this kit requires a 9-11” of clearance from the bottom bracket to the top bar. Additionally, the frame tubes should be 25mm to 29mm in diameter. Such measurements are quite flexible and will comfortably accommodate most bikes such as mountain bikes, chopper, cruisers and road bikes. The motor uses a forced air displacement cooling system which prevents overheating. Note that similar to most 2-stroke kits, this engine is rather noisy. The motor facilitates fast speeds. When selecting a bicycle engine kit, it is crucial that you choose the right type of engine kit for your bike. To do this; there are two questions you need to ask yourself. First, what is your bike’s wheel cycle? Some kits can only fit a 26” or 28” wheeled bicycle. Others can fit a 24” wheeled bicycle. Always check to see if your bike meets the wheel cycle requirement before purchase. That way you will not buy a kit that you cannot use or a kit that will force you to buy a new bike. Second, what is your bike’s seat tube height? In a typical V-frame bike, most kits demand that the seat tube height be between 9 and 11 inches. That way, there is proper clearance that will leave enough space to install the bike engine. If your bike does not meet this requirement, then you are better off purchasing a kit that can be mounted elsewhere, e.g., the rear. With these two questions answered, you will be able to purchase a kit that is right for your bike. Reviews matter when it comes to purchasing engine kits. Reviews will tell you how durable that particular bicycle kit is. Reviews will tell you if the kit is easy to install. Reviews will tell you if you will easily get replacements parts and the kind of speeds to expect. In essence, reviews will help narrow down your choices and eventually determine the specific motorized kit you will opt for. 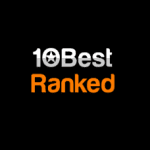 Therefore, keenly go through all the reviews from people who have purchased the product. Numerous brands offer the same product. When it comes to manufacturers of bicycle engine kits, there are five top-rated brands. Depending on the kind of bicycle engine kit you are after, make a point of comparing prices from the top-rated brands. That way, you will find a high-quality product at a favorable price. The above guide lists the top-rated motorized bicycle kits in the market today. Note that, while only three brands are on the list, more brands produce products of high quality. Make a point of researching the top brands and what reviewers say about them. After that, you will be able to determine the brand and product you prefer.